Thanks to a lighter class schedule this semester I’ve been able to do some patterns that were high on Beau’s request list, but were a little too intimidating/daunting otherwise. 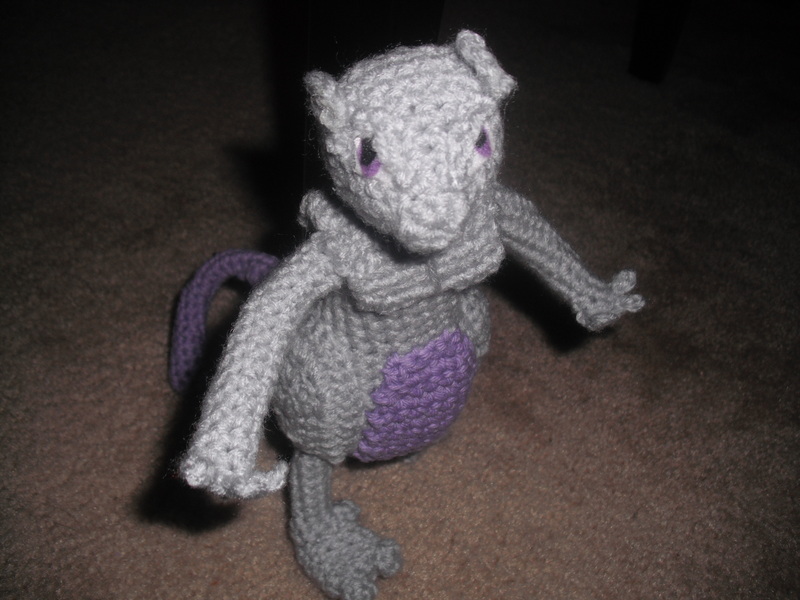 Mewtwo was one of those requests. I’ve bounced back and forth between feeling up to the task of making the first big legendary pokemon and leaving him on the wish list. 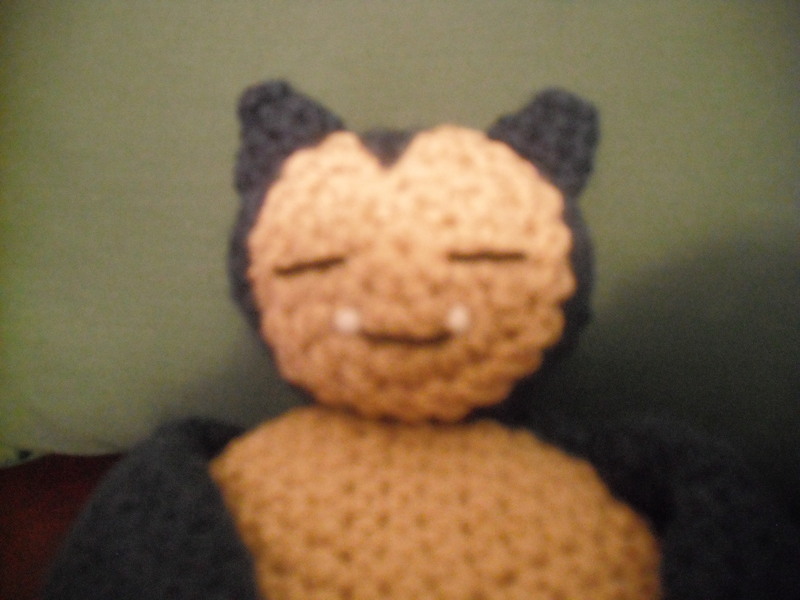 Now that he’s finished, Beau is pretty happy. He turned out smaller than I originally thought he would, but I think the small size just makes him more stable for standing and posing. 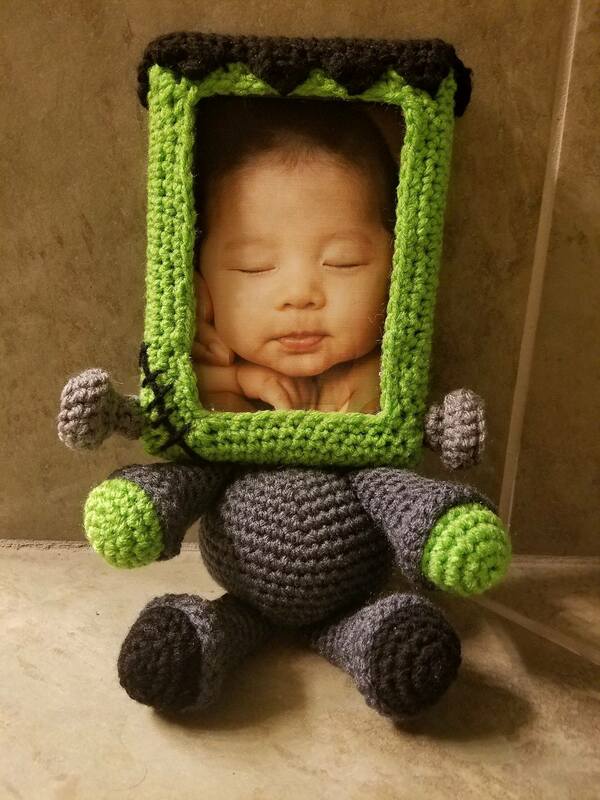 At any rate, I hope you enjoy making him as much as I did. F/o. sew over felted eye. Attach yarn to one of the loops from round 2 of arm. Chain 3, slip stitch in 2nd ch from hook and next ch. Slip stitch to next loop, chain 3, slip stitch in 2nd ch from hook and next ch. Slip stitch to next loop, chain 3, slip stitch in 2nd ch from hook and next ch. This guy doesn’t really like to stand up very well, but can if forced to every once in awhile. I put a flat rock in each of his feet to help him stand better. Sew toes onto feet and feet to leg. Sew hip onto body, and then attach leg to the hip. I then took the tail/ belly patch and sewed that on in between the two hips. The arms were then sewed on to the body. Chest added next with beginning chains on top of shoulders. Attach ears to head and head to neck. Check picture for placements. 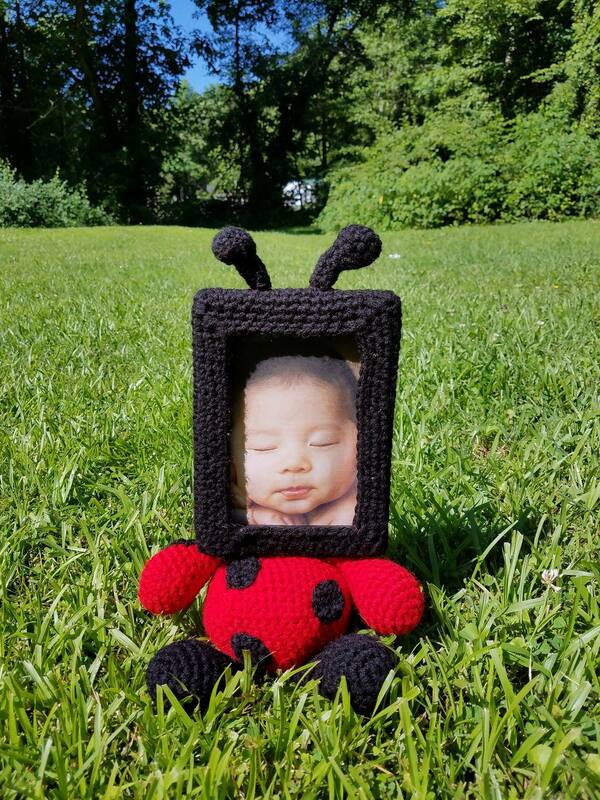 I had another one of those urges to make something simple while I complete my next BIG project. I had my eye on this one for awhile and Beau had asked for him a couple times, so I figured why not? 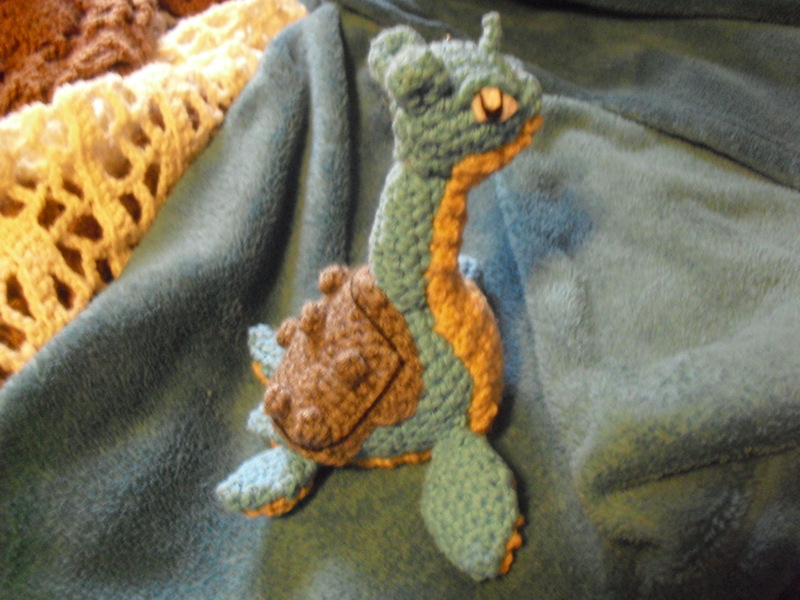 He didn’t take very long to finish, when started, and Beau is extremely happy with him, though he feels guilty that there was no felting involved. 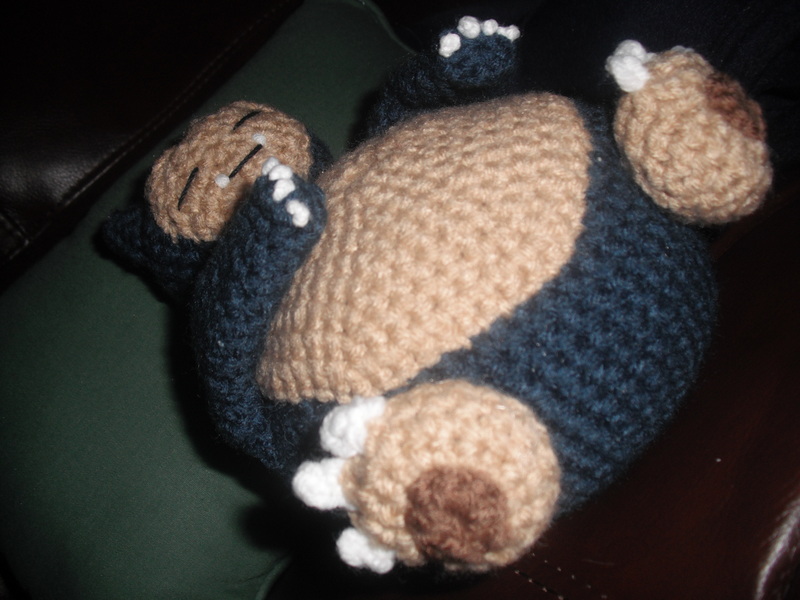 I hope you enjoy this awesome little snorlax as much as he has. Can be done with felt, but I made 2 knots with the yarn and attached them to the arm. Attach belly to F/o. side of body. Sew all facial features on. I place the face on and then the ears to help with placement. 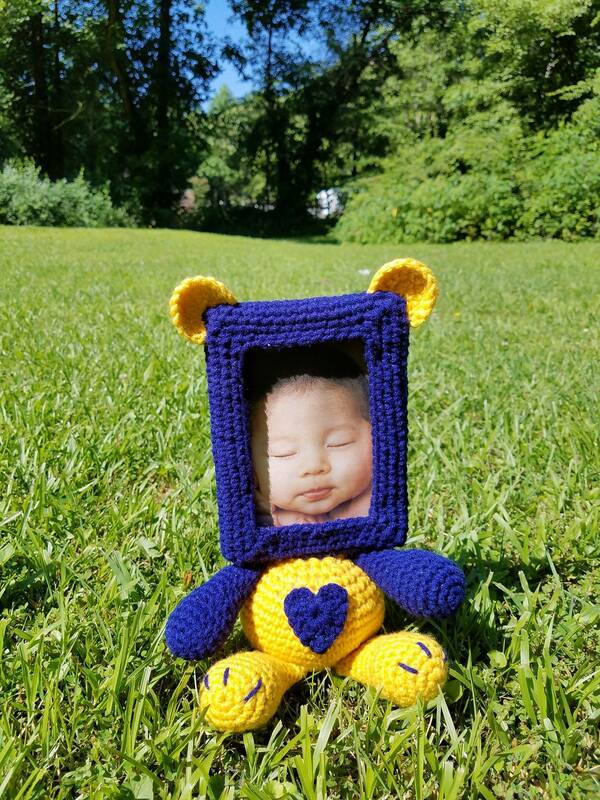 Attach head to body, slightly covering up part of the belly. Attach arms on the outside of the belly. Sew foot patch to feet and attach to body. 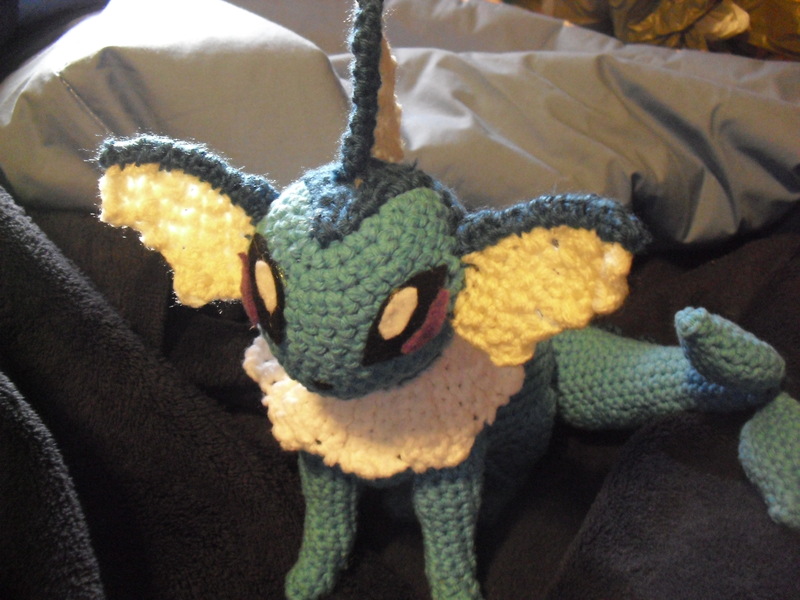 Hello everyone, it’s been a while since I was able to write up a pattern for any amigurumis I make. 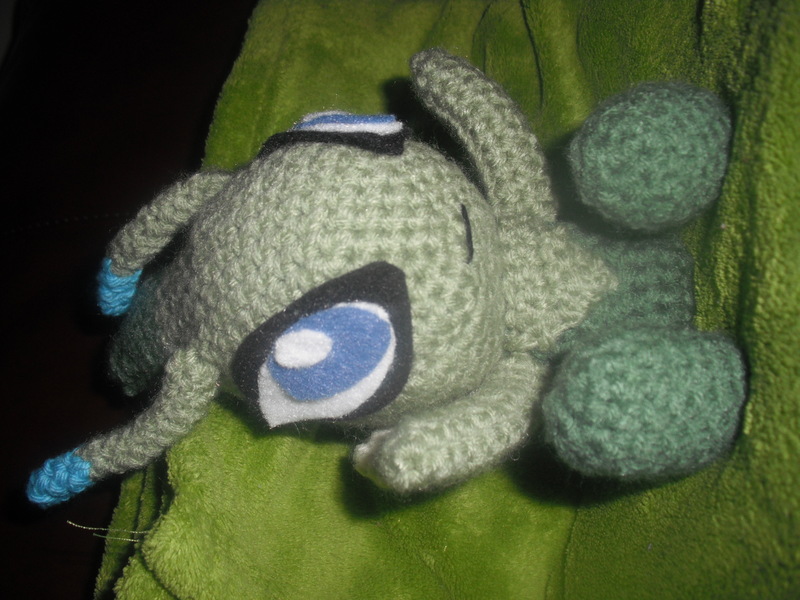 School kept me pretty busy this past semester and I lost some of the pattern for another pokemon I had made (Axew). 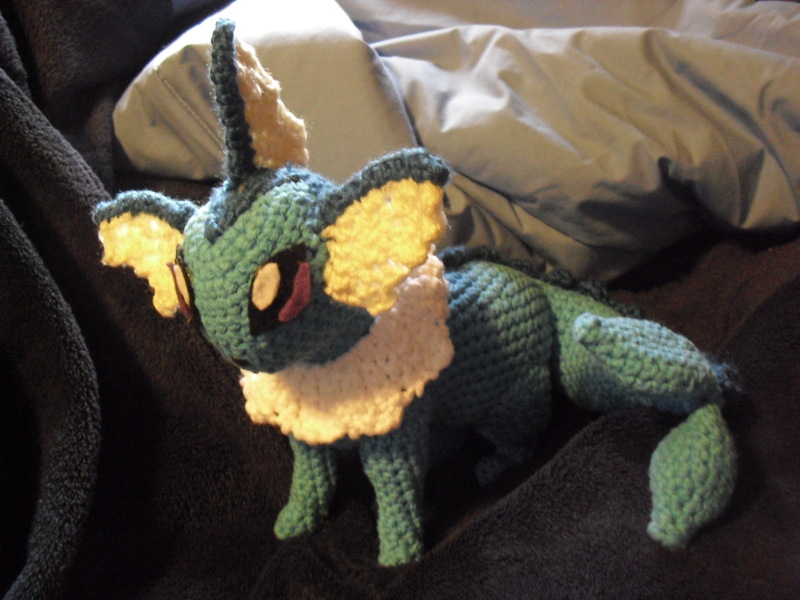 I’ll try and get the other one to you soon but in the meantime, I also finished the much requested Vaporeon. 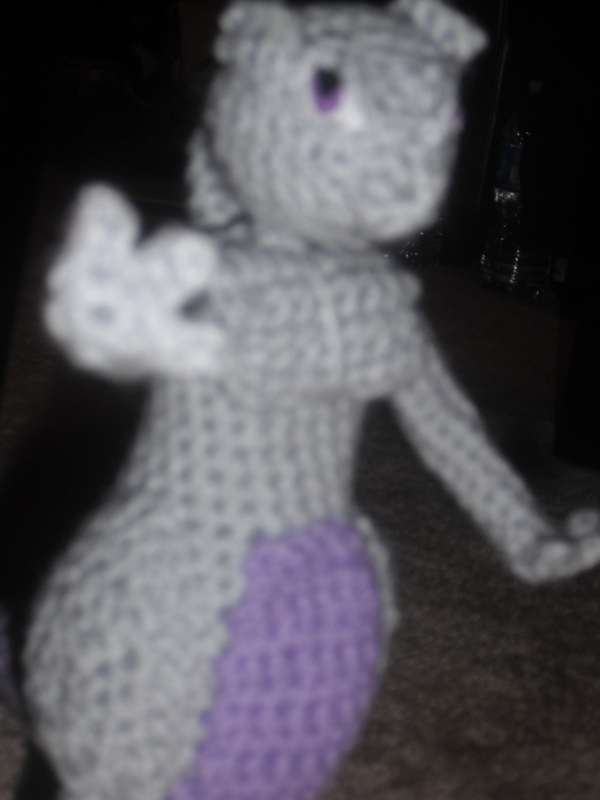 She is pretty quick to make and very posable. I have some other big projects on the way so hopefully I’ll be able to finish them before school starts again. I hope everyone had a Merry Christmas and has a Happy New Year. I used WolfDreamers Umbreon pattern to create these parts so I wanted to give her credit. The link is below to do these parts. Repeat Row 1-6 8 times. For Row 1, do not chain any more, just sc 6 and continue with all other rows. Attach legs to body and head. Check pictures for positioning. Attach tail. 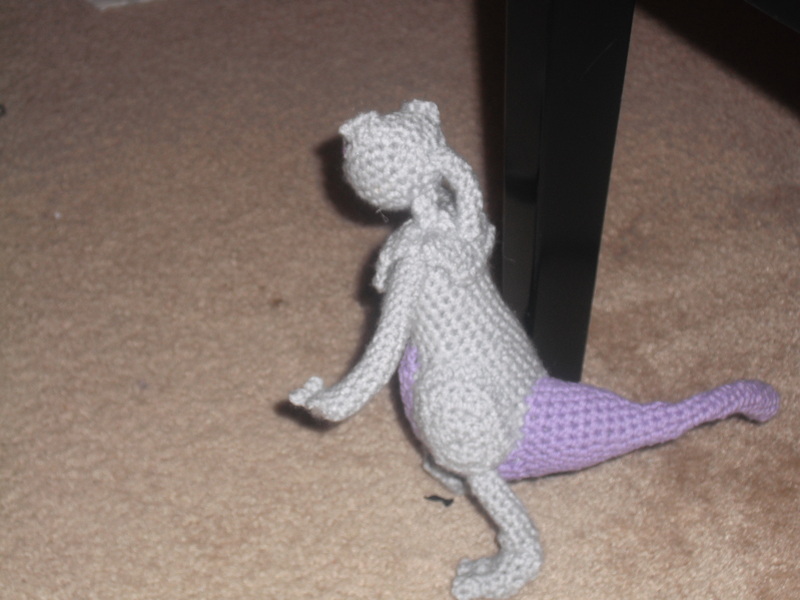 The tail should wrap around the body on one side, of your choice. 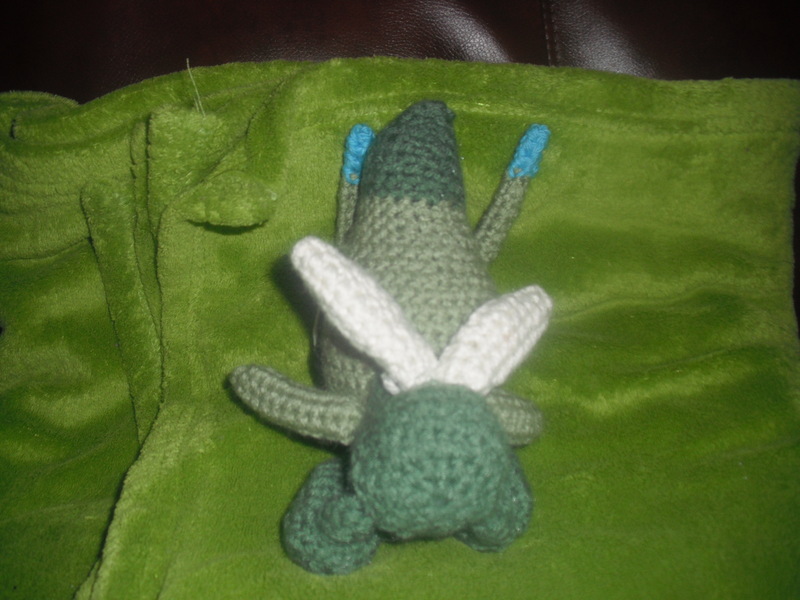 Attach flippers to the end of the tail with the f/o. 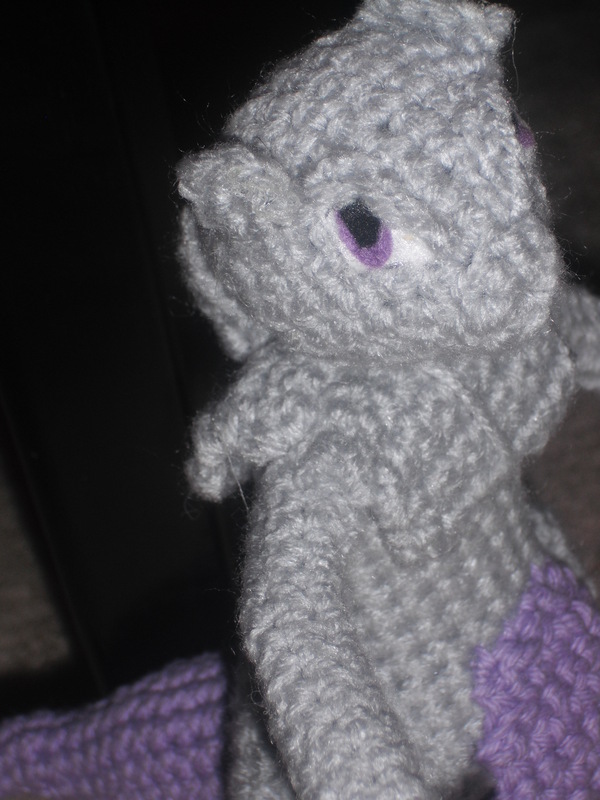 facing attaching to the tail. 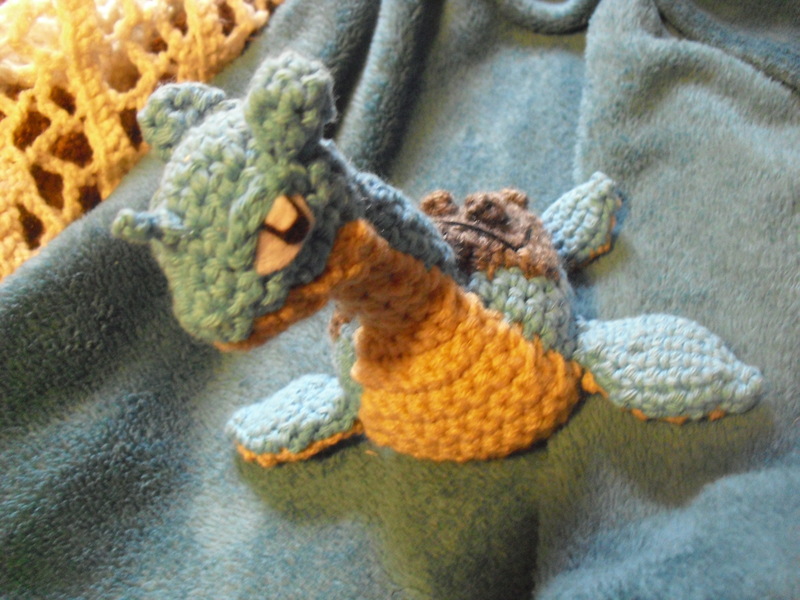 Sew the dark blue point on to the dark blue part of the head. Center he point on the part, and sew together. Then take the mane, center it on the dark blue part of the head and let it extend and wrap around the tail. Check picture for positioning. The end of the mane should meet at the start of the flippers. Take the white collar and wrap it around the neck and sew the starting chains to the f/o. side. 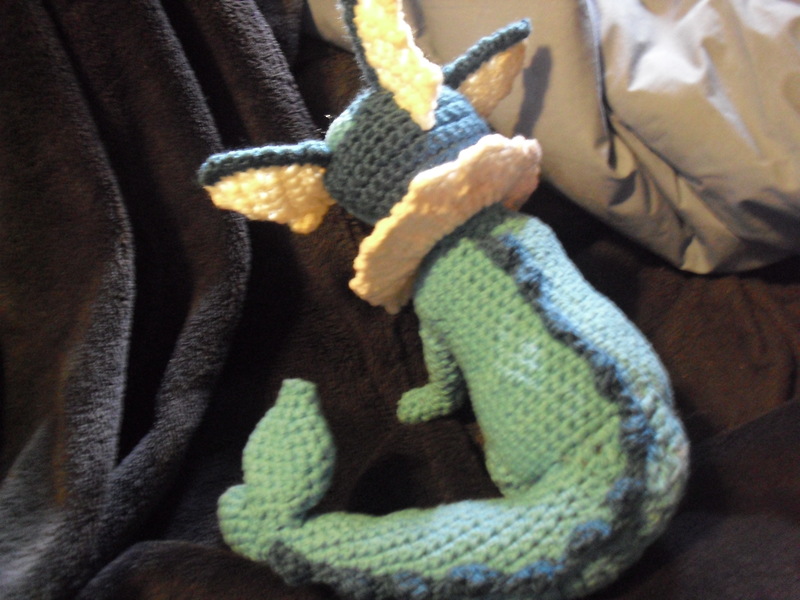 The blue part of the fins should be curled/ bent in half to sew on to the white part of the fins, the long side. Check picture if confused. Sew on each piece to the head. Felt as necessary. Sorry my assembly is so poor in directions. If you ever have questions, I’ll be happy to help. He’s finally done! 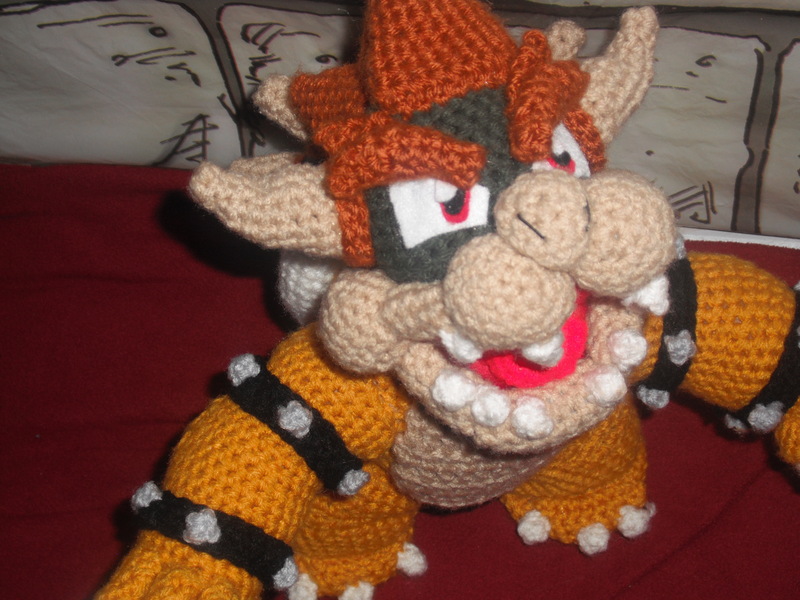 After years of pitiful pleading looks from my fiance, and months of work, I’ve finished my Bowser pattern. 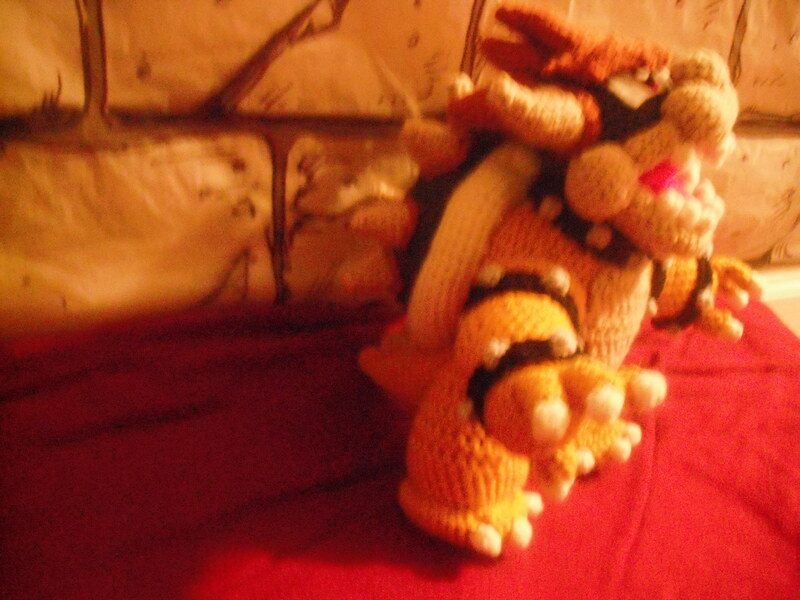 As with everything Beau asks for this amigurmi had to have a lot of little details and since he’s Bowser he had to be pretty big. 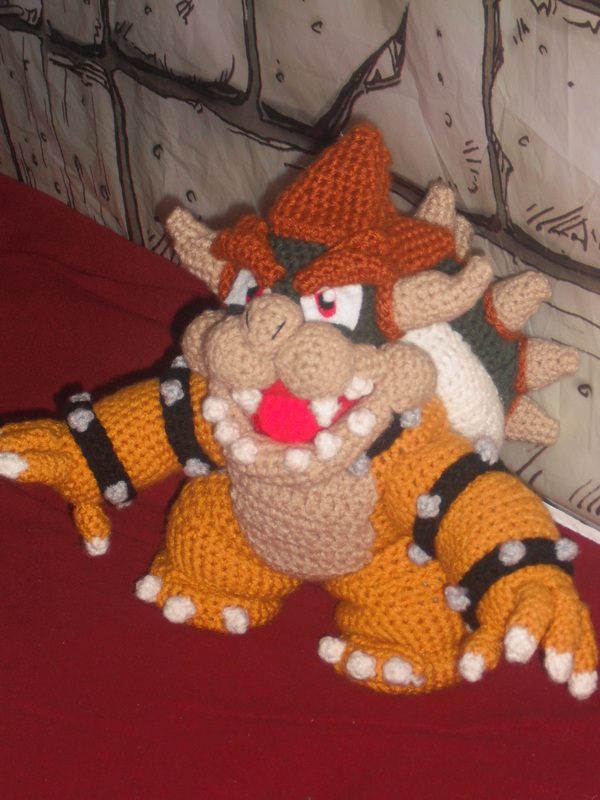 This particular Bowser is modeled off of the more recent versions of Bowser (i.e. from Mario Galaxy and Mario Kart Wii). 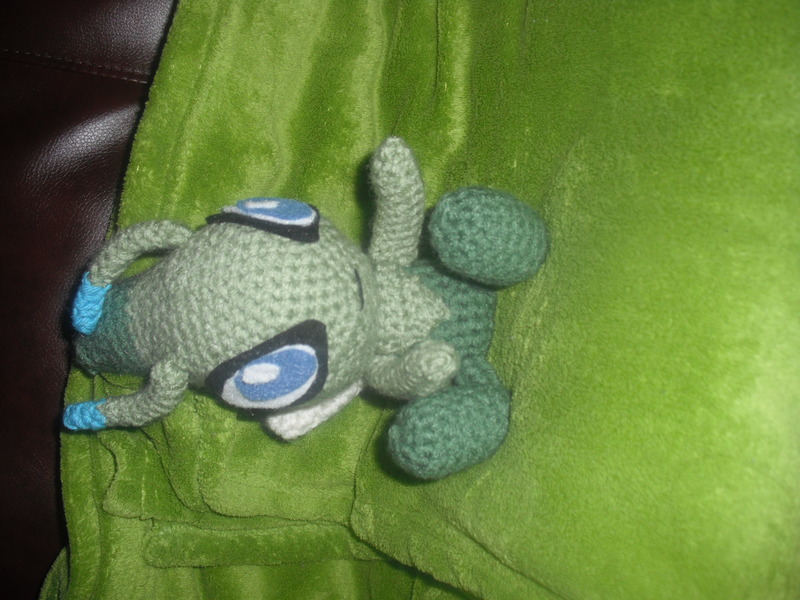 I began working on him during the summer, off and on, until school started again. This year is my last year of student teaching and I am there full time. 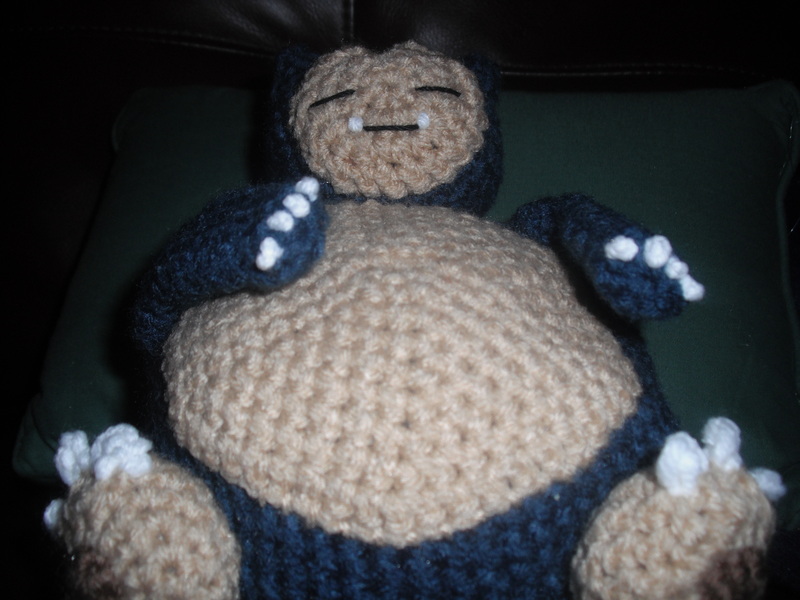 I have been so tired, I haven’t been able to do much crocheting. I finally found some time this weekend to finish him up. I hope you enjoy! 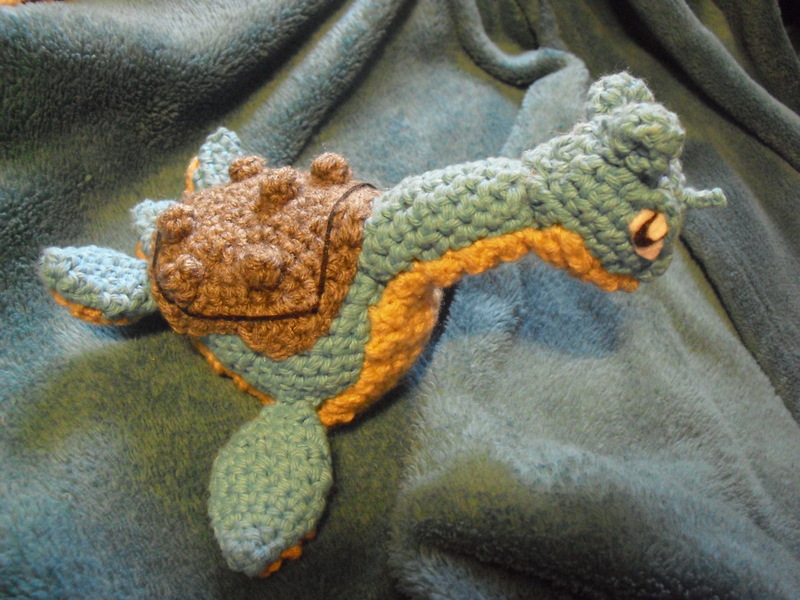 Continue until you can wrap it all the way around the shell and sew it together. Mine took about 60 Rounds. F/o. Sew both ends together and wrap around arm. There is alot of pieces to keep track of. I would get an experienced sewer to attach your pieces. I probably won’t exlain this well enough but I’m always happy to help if you have a question after reading this part. Looking at the pictures will be your biggest help for placement. I started with the the face. 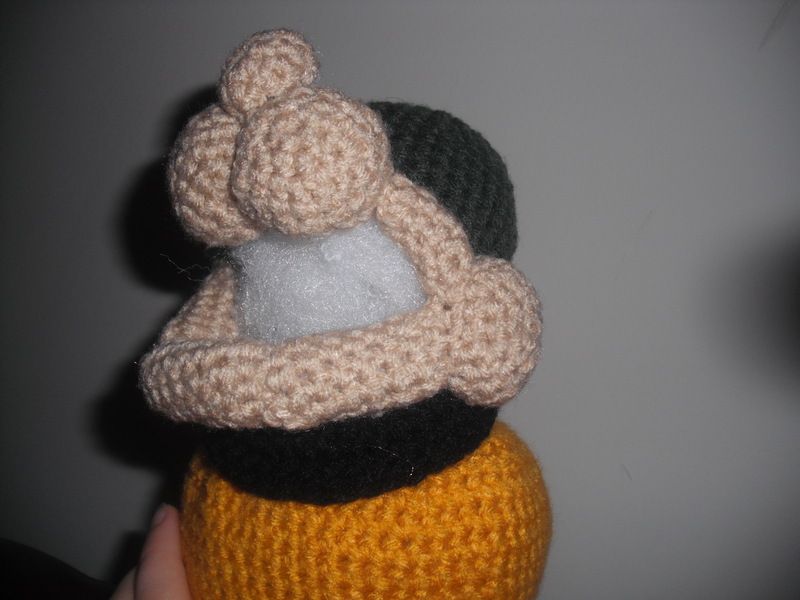 I took two of the four bigger balls and sewed them together. Then I took the smaller ball and placed it in the middle creating a nose. 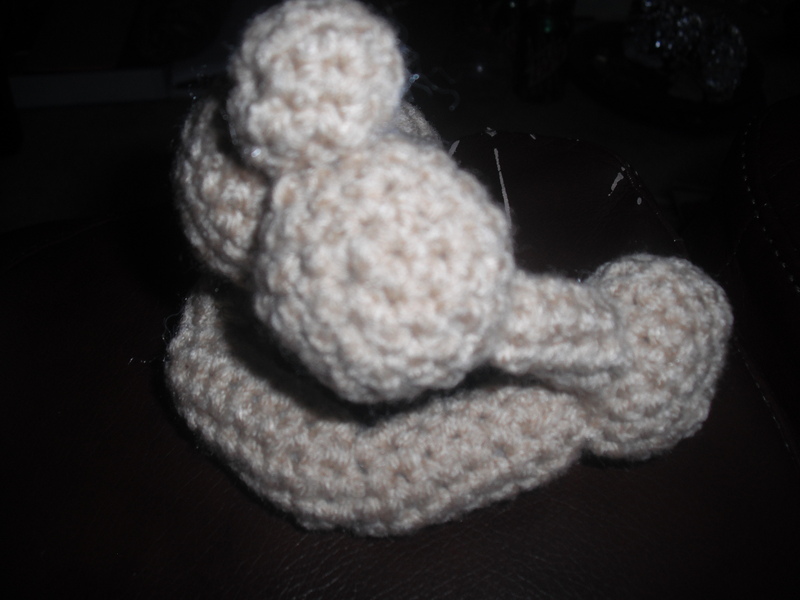 The two small pipes are then attached to the side of the 2 big balls. Afterwards, attach the last 2 bigger balls to the end of the small pipes. I then take the 3 big pipes and sew them together at an angle to form a curve for the lower jaw. 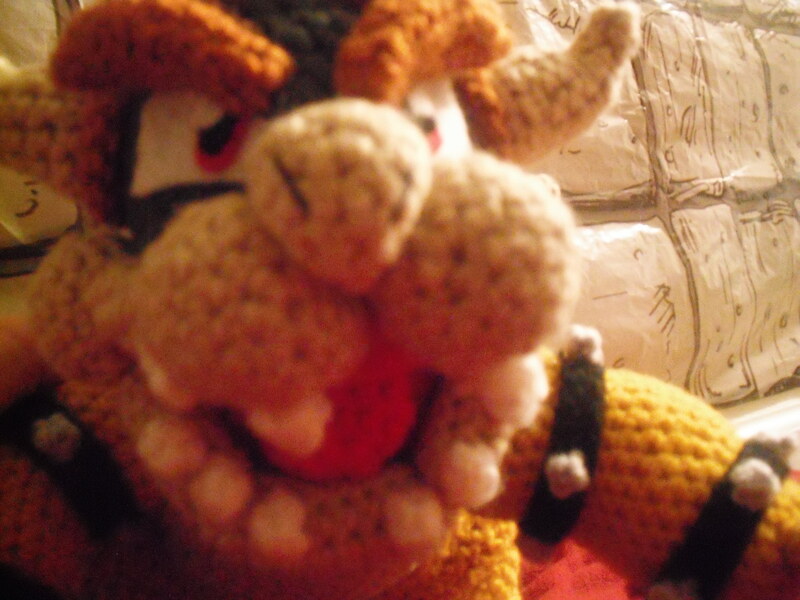 I then attached it to the big balls to create his mouth. 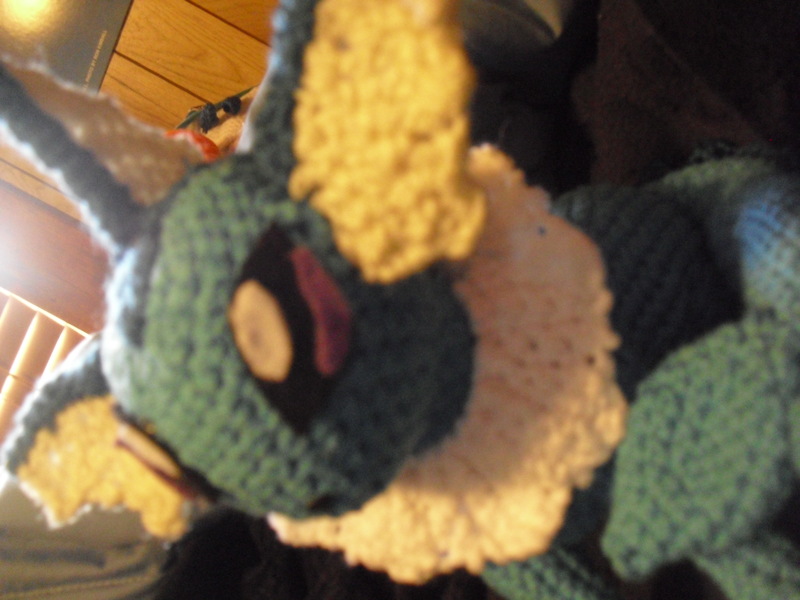 I then attached the head to the mouth and then sewed on the lower mouth piece to the bottom. This is the whole head piece. I then sewed his neck collar to the head piece. Sit this aside. I attached the finger nails to the fingers and the fingers to the arms. The arms were then attached to the body. The toe nails were placed on the feet and then sewed on to the leg. The leg was then placed on the body with the hdc facing away from the body. The tail was then added . The shell was attached to the white part of the shell and sewed on to the body. The spikes were added later. 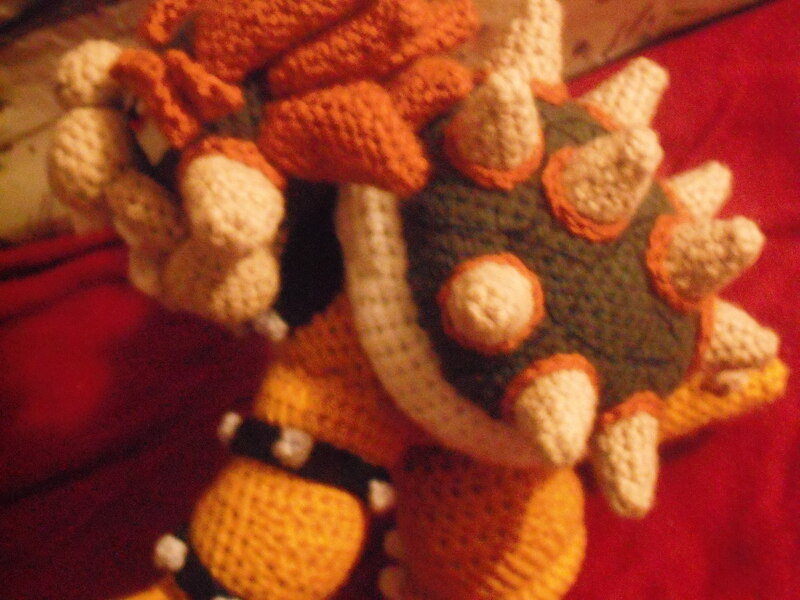 Each spike has an orange ring around them created by chaining until it wraps around the spike and sewing it on. Sew the head on to the body. Place the spikes on the side of the head and also chain around the spike. Sew the hair on to the head with a 1, 2, 1, 1, pattern starting from the bottom of the head coming up to the top. Cut out the felt for the eyes and then place eyebrows on after. The upper flap should be sewed on to the lower eyebrow. The teeth should then be added to the mouth and the spikes should be attached to the ribs around his arms. I sewed in a red piece of felt into his mouth to cover up the stuffing. You can add a tongue if you wish. The belly patch was the last thing added. 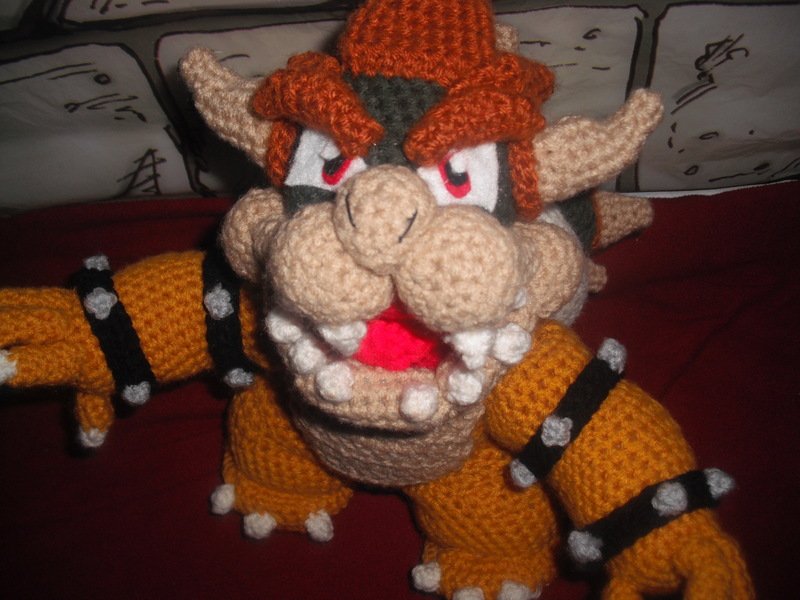 I realize Bowser is hard to put together so I am going to slowly go through and re-make him following my pattern and adding picture of how I put him together for those who may want some extra help with assembly. Connect the green head to the mouth. Will have hang over on the back side. Sew under mouth to close off gap. Sew black collar on following the seam of the buff and green and then around the under side of the mouth. The headd is attached on to the f/o. side of the body. Leaning the head slightly forward at an angle. Assembly: sew head onto body at an angle. Attach arms and legs to body. Feet should then be added. Once the arms are placed, sew on the chest patch in the appropriate position. Sew on head feelers in appropriate locations and cut felt shapes for the eyes. Flatten as you go and continue until it creates a nice spiral shape. Chain 3, slip stitch in 2nd chain from hook, sc in last chain. Sew on to head. 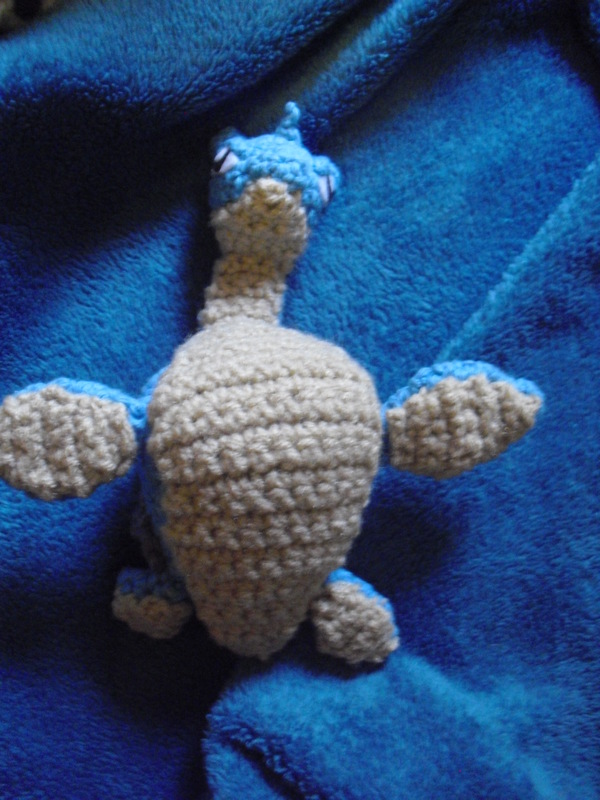 Sew all the blue parts of Lapras’ body together. Check pictures for placement. 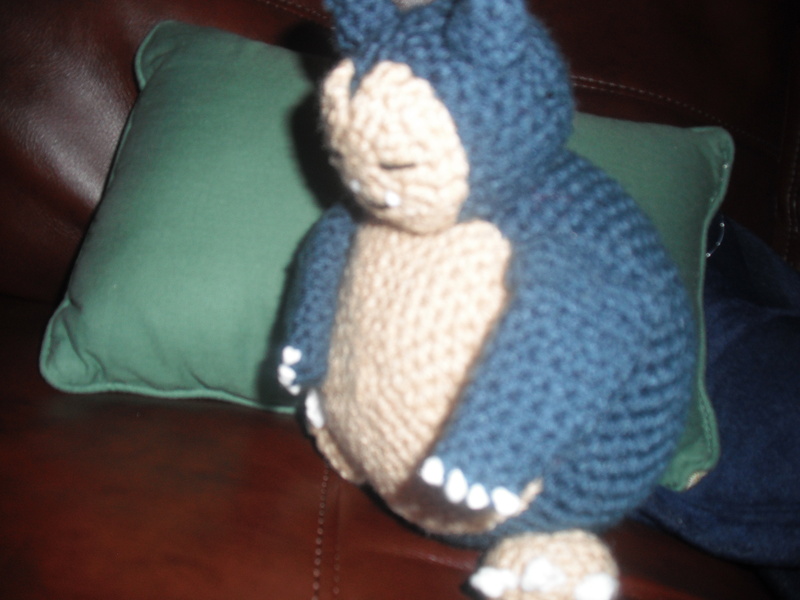 I then attached the belly starting from the mouth and sewed my way around. The bottom parts of the flippers were then attached in any order. 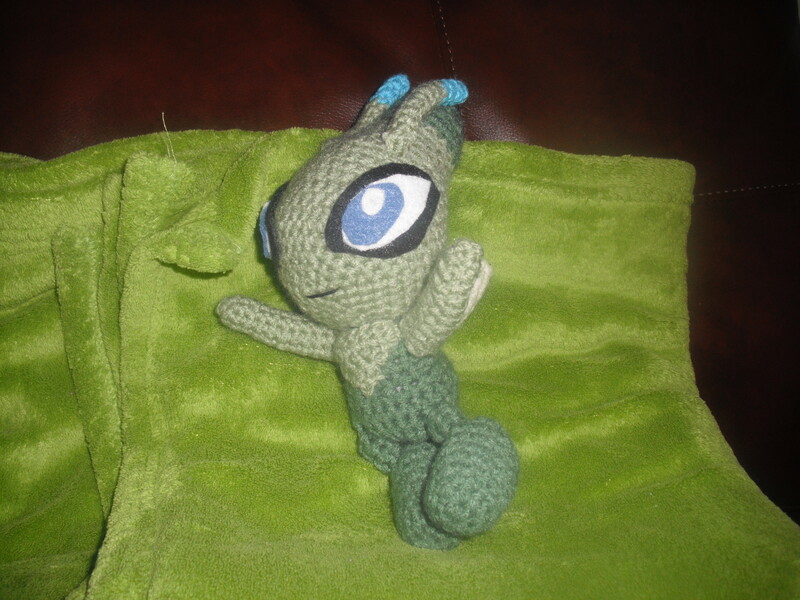 (This can even be done before sewing flippers onto body.) Sew on the shell to the back. Position the points of the body like in picture. 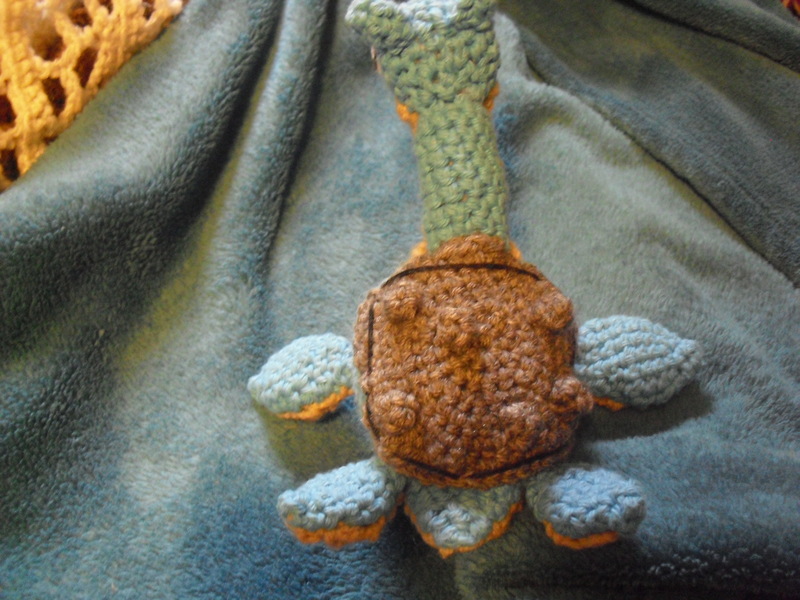 (the shell does come out shaped a little awkward but works when sewed on. Cut out felt and place accordingly. Also after placing the felt, create eyebrows by chaining as many as needed to cover the top part of the eye.